The Rocky Patel Vintage 1999 is the only hand-rolled premium cigar on the market today sporting a US Connecticut Shade wrapper. This smooth, creamy smoke is infused with filler blends of seven-year-aged Nicaraguan and Dominican long-leaf ligero tobaccos. The Vintage 1999 are medium-bodied offering a perfect balance of toasty flavors and aromas with notes of creaminess, nuts, and sweet hints of earth. 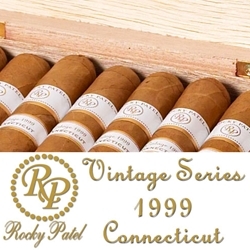 Rocky Patel Vintage 1999 are one of the finest premium cigars desired by connoisseurs worldwide who enjoy a relaxing and enjoyable smoking experience. Smokers Discounts can bring Rocky Patel Vintage 1999 handmade cigars right to your front doorstep. We’ve made it easy and affordable to buy premium cigars online. A variety of sizes and flavors are listed below. Each of these styles are in stock and available for a low discount price! Call us for more details!